Did you know that you can circumnavigate Florida via kayak? I’m sure you’re wondering what this has to do with hiking the ECT. So here’s the deal the trail starts in Key West which requires quite a bit of road walking including a 7 mile bridge ocean crossing. I think an ocean crossing is totally mind blowingly cool. But I’m not sold on the bridge aspect or road walking. The Keys are so biologically diverse and offer up their own unique adventure. My goal is to aquablaze the first 100 miles camping island to island via The Florida Circumnavigational Saltwater Paddling Trail, Segment 15 using sea kayaks. Check the trail out below. So yeah, did I mention we have never been sea kayaking before a couple weeks ago. Oh and January is high season for the Keys meaning everything gets booked early. Let’s not forget we would be starting at the end of the trail and paddling into the headwind, possibly passing cruiseliners. With that said, first things first. We went out on the water a couple of weeks ago to see if we could handle ourselves. It went exceptionally smooth, even the Mountain Mutt was totally at home on the water, she is a water dog. (We left baby Gooch at home this time.) 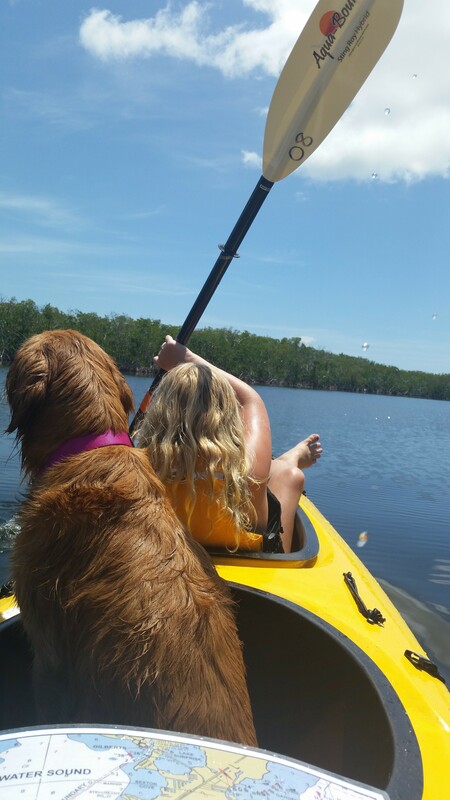 We paddled a total of 5 miles in half a day. The present estimate is that we could probably cover 12 miles a day, in good weather. The next time we go out we will try for at least 12 miles and tip the kayaks to see if we can make it back in. There is nothing more entertaining then putting two teen brothers in a kayak and watching them try to coordinate. It is similar to watching a ping pong ball bounce everywhere. As many times as they started out to sea never to be seen again until called back by their mother they probably paddled closer to 10 miles! Yes and I’ll tell you why. I am embracing Florida’s ecological challenges in the spirit of the hiker community. We have all heard “Hike your own hike” but what does that truly mean? To me it means to explore the challenges that each diverse ecosystem offers up. We are going where no Mountain Mutt has gone before!